In honor of the theatrical release of Disney’s Christopher Robin, Cyclops Print Works will be releasing their first screen print featuring everyone’s favorite silly ol’ bear! 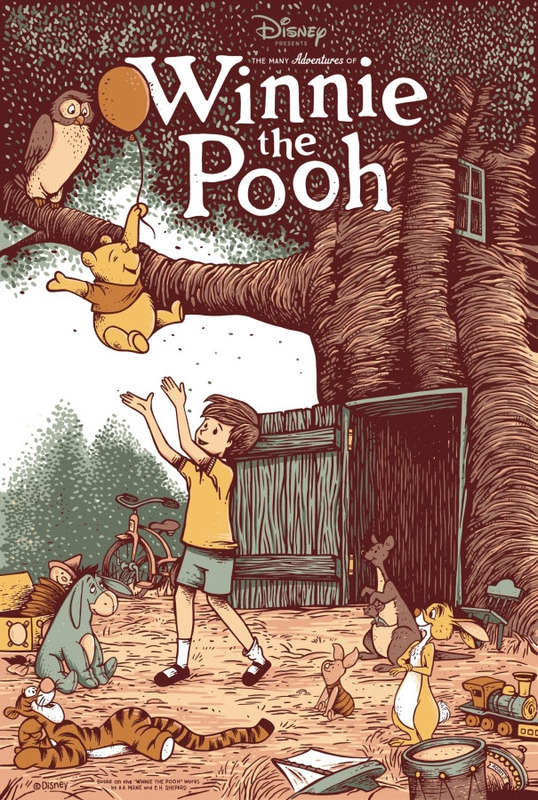 The Many Adventures of Winnie the Pooh Screen Print by Adam Johnson whimsically captures a sweet moment in the Hundred Acre Wood between Pooh, Tigger and all their friends. The Many Adventures of Winnie the Pooh by Adam Johnson is a 20”x30” hand numbered 9 color Disney screen print on Coventry 320 gsm paper with a varnish finish. Limited to just 160 pieces, this wonderful Winnie the Pooh poster will go on sale at 12pm PDT on Thursday, August 2nd, at the Cyclops Print Works online store.